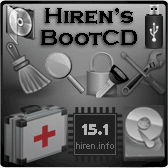 Although the normal method of running Hirens Boot Disk is to burn Hiren’s.BootCD.15.1.iso to a CD and then boot from the CD, an easier and more versatile method is to burn the Hirens Boot CD ISO to a USB Flash Drive. This has to be one of the most useful things I have come across recently – it gives you a portable fast-loading stripped down copy of Windows XP that boots fast from a USB flash drive. You can boot a dead or malfunctioning system, copy data – such as valuable images and files – back to the USB flash drive. It can also be used to recover the drivers from a dead system, and passwords – such as Windows XP or Windows 7 product key, Office product key etc. 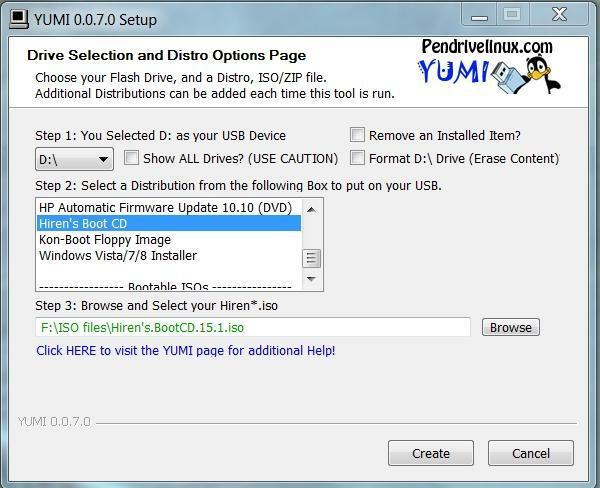 Yumi is run as a stand-alone installer. Insert your USB Flash drive and run Yumi. Your flash drive will be detected. An 8gb Flash drive leaves considerable space for copying and moving data from an unbootable PC – so we can add a folder called RECOVERED where we can copy data from the PC we are working on. It is often possible to change the boot order by pressing F12 or F8 just after the system starts to power up – this image shows the Boot Menu that comes up after pressing F12 on a Dell PC. Just after the system starts, press Del or F1 to enter the Bios. 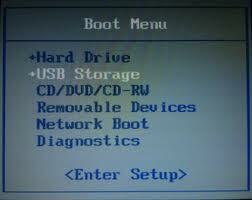 The boot order can be set usually from the Advanced Boot Configuration menu. Mini XP starts to load..
Avira AntiVir Personal (07-12-2011): Free anti-virus and anti-spyware on-demand scanner, detects and removes more than 50000 viruses and trojans. ClamWin Free Antivirus 0.97.3 (07-12-2011): A free antivirus, GNU GPL Open Source Virus Scanner. ComboFix (07-12-2011): Designed to cleanup malware infections and restore settings modified by malware. Dr.Web CureIt! Antivirus: a free standalone anti-virus and anti-spyware on-demand scanner (downloadable). GMER 1.0.15: Hidden services, hidden registry, hidden file scanner, Rootkit Detector and Remover. Malwarebytes Anti-Malware 1.51.1 (07-12-2011): anti-malware application that can thoroughly remove even the most advanced malware. Remove Fake Antivirus 1.82: a tool to remove virus/malware which disguises itself to be an antivirus and produces fake alert/warnings and urge you to purchase a useless copy of the fake antivirus. Spybot – Search & Destroy 1.6.2 (07-12-2011): Application to scan for spyware, adware, hijackers and other malicious software. SuperAntispyware 5.0.1134 (07-12-2011): Remove Adware, Malware, Parasites, Rootkits, Spyware, Trojan, and Worms (a must have tool). TDSSKiller 2.6.21.0: To remove malware belonging to the family Rootkit.Win32.TDSS aka Tidserv, TDSServ and Alureon. CloneDisk 1.9.6: All in one tool for MBR, Partition, Disk, VMWare Disk images vmdk/vmx/vhd, and much more. CopyWipe 1.14: Copy old hard drive to a new hard drive by copying the entire contents of one drive to another, CopyWipe can also help prevent confidential or private data from being recovered, by securely wiping the contents of a drive. DiskImage 1.6: Creates and writes disk images files to hard and floppy disks. Drive SnapShot 1.40: creates an exact Disk Image of your system into a file while windows is running. FastCopy 2.08: The Fastest Copy/Delete Software on Windows. G4L Ghost 4 Linux 0.34a: a hard disk and partition imaging and cloning tool similar to Norton Ghost. GImageX 2.0.17: ImageX is used to backup/restore WIM images for Windows XP/Vista and Windows 7. Image For Dos 2.66: Q uickly, easily, and reliably create a complete image backup of all the data located on your hard drive, backups made to CD/DVD/BD are bootable. Image For Windows 2.66: Backup and restore utility that creates a snapshot of a selected partition or volume, and saves it to disk, or burns it directly to most DVD+RW+R-R-RW or CD-R/RW drives. ImgBurn 2.5.6.0: Lightweight CD/DVD/HD DVD/Blu-ray burning application, supports BIN, CUE, DI, DVD, GI, IMG, ISO, MDS, NRG and PDI, Ability to build DVD/HD/BD Video discs from a VIDEO_TS/HVDVD_TS/BDAV/BDMV folder, Unicode folder/file names (formerly DVD Decrypter). InfraRecorder 0.52: An Open source CD/DVD burning software, also create/burn .iso images. Macrium Reflect 4.2.3775: Create complete backups of your disk partitions, including operating system, installed programs and all your settings. ODIN 0.3.4: Open Disk Imager in a Nutshell is similar to Drive Snapshot which supports backing up windows while you are using it. Partition Image – PartImage 0.6.9: supported filesystem includes Ext2, Ext3, Reiserfs, HFS, HPFS, JFS, Xfs, UFS, Fat16, Fat32 and NTFS. Partition Saving 3.90: A tool to backup/restore partitions (SavePart.exe). RegBak 1.0: a light-weight and simple utility to create backups of Windows registry files. Raw Copy 1.2: Useful tool to transfer the data directly from a faulty drive to another drive, built in data recovery function which will also attempt to recover data from bad sectors. ShadowCopy 2.00: Copy all your files and entire system – even if they are locked by Windows. SelfImage 1.2.1.92: to create image files of any mounted or unmounted hard disk partition. TeraCopy 2.12: TeraCopy is a compact program designed to copy and move files at the maximum possible speed, providing the user a lot of features includes pause, resume, auto shutdown, verify, error recovery and unicode support. WhitSoft File Splitter 4.5a: a Small File Split / Join Tool. XXClone 0.58.0: The simple way to clone a Windows disk to another disk, it makes a self-bootable clone of Windows system disk. BIOS Cracker 5.0: BIOS password remover (cmospwd). 7-Zip 9.22: File archiver with a high compression ratio Supports 7z, ARJ, BZIP2, CAB, CHM, CPIO, DEB, DMG, FAT, GZ, GZIP, HFS, IMA, IMG, ISO, LZH, LZMA, MBR, MSI, NSIS, NTFS, RAR, RPM, TAR, UDF, VHD, WIM, XAR, XZ, ZIP and Z formats. Bulk Rename Utility 2.7.1.2: Rename multiple files, change timestamps and rename using EXIF data with the click of a button. EasyUHA 1.1: GUI Tool to create and extract UHA Archives. Everything 1.21: Ultra fast file/folder search tool with ftp/http server. Explore2fs 1.08b: GUI explorer tool for accessing linux ext2 and ext3 filesystems under windows. Ext2Explore 2.2.71: To explore ext2/ext3/ext4 disk/partition, can also be used to view and copy disk and file system images. HashMyFiles 1.72: Calculate MD5/SHA1/CRC32 hashes of your files. 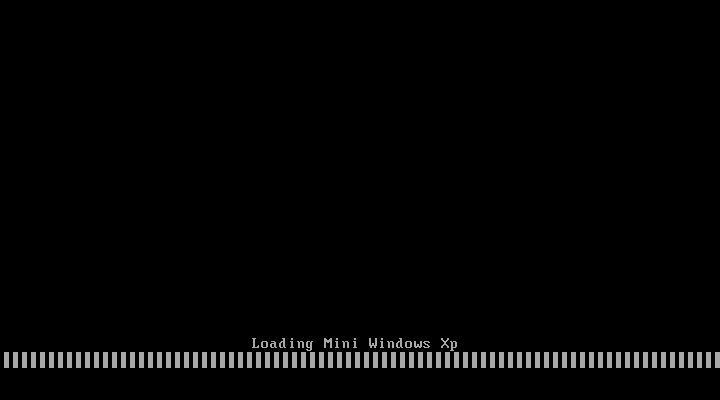 Mini Windows Xp: Portable Windows Xp that runs from CD/USB/Ram Drive to repair/recover dead windows operating system. It has LAN and WLAN (Wireless) Network includes 300 WiFi/Ethernet card drivers and can also be customized easily to add your own drivers in HBCD\Drivers folder. Added some USB 3.0 and SATA/SCSI/SAS Storage drivers, Dynamic disk Spanned/Striped/Mirrored/RAID-5 Volume support, PDF Printer and VBS/WSH scripting support. Supported keyboard layouts are: United States, United Kingdom, US Dvorak, Arabic, Turkish Q, Turkish F, Swiss German, Swiss French, Swedish, Suomi Finnish, Spanish, Slovenian, Slovak, Russian, Portuguese, Polish, Norvegian Norske, Netherlands Dutch, Latin American, Italy, Icelandic, Hungarian, Hebrew, Germany, German Switzerland Luxembourg, Francais Cavier AZERTY, Denmark Daenish, Bulgarian Phonetic, Bulgarian, Brazil Portuguese, Brazil Extended Portuguese and Belgium. Opera Web Browser 11.01: One of the fastest, smallest and smartest full-featured web browser with an email client. SearchMyFiles 1.80: Alternative to ‘Search For Files And Folders’ module of Windows + Duplicates Search. Total Commander 7.56a: A file manager similar to the Windows Explorer features side-by-side file-browsing panes, built-in FTP, archive management, file search/compare/synchronize and more. WinMerge 2.12.4.0: Differencing and merging tool which can compare both folders and files, presenting differences in a visual text format that is easy to understand and handle. All Users Temp Cleaner 1.1: To clean all users temp folders, unwanted windows files from an offline installation. ATF Cleaner 3.0.0.2: A personal and easy-to-use temp file removal software to clean all user temp folders, Java cache, Opera/Mozilla browser cache, cookies, history, download history, saved passwords etc. CCleaner 3.12.1572: Crap Cleaner is a freeware system optimization and privacy tool. CleanUp! 4.5.2: Removes junk files from all user profiles that accumulate over time and litter your hard drive. CloneSpy 2.62: Duplicate file cleanup tool, can optionaly create hardlinks to save space. Delete Doctor 2.2: Delete Files that are hard to delete, Option to delete on reboot or via UNC Name. Duplicate File Finder 3.5: Scans and identify duplicate files, it compares them based on byte for byte comparison ensures 100% accuracy. MyUninstaller 1.74: Alternative to the standard add / remove control panel module. PC Decrapifier 2.2.8: Removes unwanted preinstalled/bundled software from Windows XP/Vista/7 that usually comes with HP/Dell/Acer etc machines. Print Flush 1.3: To clean the print spool it restarts the print spooler and deletes junk print files. Revo Uninstaller 1.93: Remove unnecessary files and registry entries left behind by incomplete program uninstallation routines. SpaceSniffer 1.1.2.0: Find lost space on your disks the easy way. 3DP Chip 11.10: This tool will help you to find right drivers for your devices and download the latest device drivers with few simple clicks. Device Doctor 2.0: Scans the hardware and checks to see if there are new driver updates available, also checks for the unidentified devices. Double Driver 4.1: Driver Backup and Restore tool. PCI 32 Sniffer 1.4 (12-09-2011): device information tool which is similar to unknown devices. UnknownDevices 1.4.20 (12-09-2011): helps you find what those unknown devices in Device Manager really are. USBDeview 1.95: View/Uninstall all installed/connected USB devices on your system. Atlantis Word Processor 1.6.5.5: Compact, fast-loading, but still powerful and efficient, perfect companion for a wide range of your word processing tasks, supports RTF, MS Word DOC 6.0/95/97/2000/XP/2003 and DOCX. IrfanView 4.30: A free Image Viewer/Editor/Converter and Optimizer. Notepad++ 5.9.3: A text editor and source code editor supports Unicode files, Regular expression find and replace (also in files), tabbed editing, Syntax highlighting and Drag-and-drop. PhotoFiltre 6.5.2: A complete image retouching program (Mini Photoshop) allows you to do simple or advanced adjustments to an image and apply a vast range of filters on it. Spread32 1.18: Mini Excel with all of the basic features of a spreadsheet program. Run macros, draw objects, generate charts, calculate functions and formulas, reads and writes xls, csv, text, and pxl formats. SumatraPDF 1.1: a free, open source, lightweight PDF Reader for Microsoft Windows. AlternateStreamView 1.31: View/Copy/Delete hidden NTFS Alternate Data Streams. EditBINI 1.0 1: to Edit boot.ini on NTFS Partition. Ext2fsd 0.51: Linux ext2/ext3 file system driver which supports read and write support in Minixp. FileDisk Mount Tool 25: to mount ISO/BIN/NRG/MDF/IMA/IMG images on windows. Filemon 7.04: Monitors and displays file system activity on a system in real-time. Junction 1.04: Create/View/Delete Windows junction/reparse points on an NTFS drive. NTFS Access 2.1: Set NTFS permissions recursively and full access rights to a folder/file owner. NTFS Dos 3.02: to read-only access ntfs partitions from Dos. NTFS4Dos 1.9: to read and write ntfs partitions from Dos. NTFSLinksView 1.05: To view list of all symbolic links, junctions and their target paths. Active Kill Disk 4.1.2393: Securely overwrites and destroys all data on physical drive. CrystalDiskInfo 4.0.1: HDD health monitoring utility, displays basic HDD information, monitors S.M.A.R.T. values and disk temperature. Darik’s Boot and Nuke (DBAN) 1.0.7: Completely deletes the contents of any hard disk it can detect. DiskView 2.4: to view graphical map of your disk, allowing you to check where a file is located or, by clicking on a cluster, seeing which file occupies it. DiskWipe 1.2: Securely erases the contents of a disk replacing it with random data or leaving the drive completely blank. ExcelStor’s ESTest 4.50: ExcelStor hard disk diagnostic utility. Fujitsu HDD Diagnostic Tool 7.00: to check IDE drives for possible defects/problems. Fujitsu IDE Low Level Format 1.0: Low Level Format Tool for Fujitsu Drives. Gateway GwScan 5.12: Gateway hard drive diagnostic utility. Hard Disk Sentinel 1.00.5: Hard Disk health, performance and temperature monitoring tool. HDTune 2.55: HD Tune is a hard disk health, benchmarking, error scanner and information tool. HDAT2 4.53: the main function is testing and repair (regenerates) bad sectors for detected devices. A freeware alternative of HDD Regenerator. HDD Capacity Restore 1.2: This tool allows you to restore factory capacity of any hard drive. it does not read from or write to the user data area or perform any kind of formatting, only alters HDD firmware (HPA and DCO settings). HDD Low Level Format Tool 2.36: Low-level format tool for S-ATA (SATA), IDE (E-IDE), SCSI, USB, Flash Cards and FIREWIRE external drive enclosures. HDD Scan 3.3: HDDScan is a Low-level HDD diagnostic tool, it scans surface find bad sectors etc. IBM Hitachi Drive Fitness Test 4.16: quickly and reliably tests SCSI, IDE and SATA drives. IBM Hitachi Feature Tool 2.15: allows you to control some of the features of the the HDD. Maxtor amset utility 4.0: Utility for changing Acoustic Management on the hard drives. Maxtor Low Level Formatter 1.1: Maxtor’s Low Level Format Utility works on any harddrive. Maxtor PowerMax 4.23: designed to perform diagnostic read/write verifications on Maxtor/Quantum hard drives. MHDD 4.6: Precise diagnostic of the mechanical part of a drive, perform Low-level format, Bad Sector Sepair, access raw sectors, manage S.M.A.R.T. (SMART) and other drive parameters such as acoustic management, security, Host Protected Area, etc. Samsung Disk Diagnose (SHDIAG) 1.28: to diagnose the disk when suspected to have failures. Samsung ESTOOL 3.01 v: Drive Diagnostic, Automatic Acoustic Management, Enable/Disable SMART etc. Samsung HDD Utility(HUTIL) 2.10: The Drive Diagnostic Utility. SeaTools for Dos: GUI 2.23 Text 1.10 versions to test Seagate or Maxtor Parallel ATA (PATA and IDE) and Serial ATA (SATA) interface disc drives. Toshiba Hard Disk Diagnostic 2.00b: Toshiba hard drive diagnostic utility. ViVard 1.0: HDD low-level diagnostics, Surface test with remap, SMART-attributes etc. WDClear 1.30: Restore/Erases the drive back to a factory condition. WDIDLE3 1.05: Modifies the behavior of a Western Digital Green drive to wait longer before positioning the heads in their park position and turning off unnecessary electronics. Western Digital Data Lifeguard Tools 11.2: for the installation of Western Digital EIDE Hard Drives. Western Digital Diagnostics (DLGDIAG) 5.19: to quickly and efficiently verify the status of the drive. BellaVista 1.1.0.66: Formerly BCD Editor with lots of options to configure Windows for a developer. BootFix Utility: Run this utility if you get ‘Invalid system disk’ message. BootSect 6.0.6: Boot Sector Manipulation Tool, This tool replaces FixFAT.exe and FixNTFS.exe. BootICE 0.9.2011.0512: a boot sector manipulation utility to edit MBR/PBR/BCD. DiskMan 4.2: all in one tool for cmos, bios, bootrecord and more. FbInst 1.6: A tool to create universal flash boot disk that boots from all computers. Grub4Dos installer 1.1: an universal boot loader GRUB for DOS GRLDR installer. 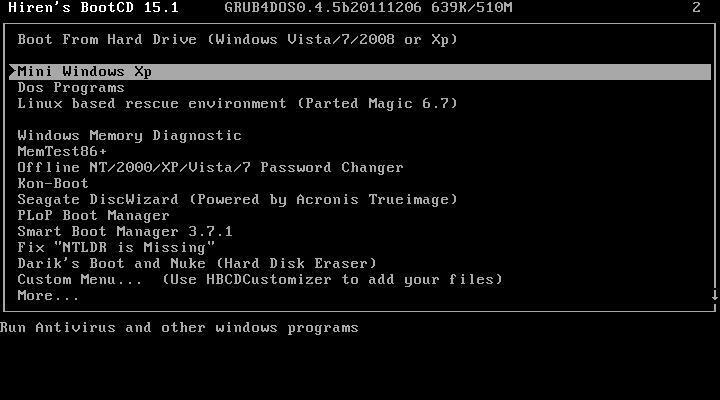 grub4dos 2011-12-06: an universal boot loader based on GNU GRUB, can boot off DOS/LINUX or via Windows boot manager/syslinux/lilo or from MBR/CD, builtin BIOS disk emulation. HDHacker 1.4: Load/Save/View MBR and BootSector from a physical/logical drive. isolinux 4.04: a boot loader for Linux/i386 that operates off ISO 9660/El Torito CD-ROMs in ‘no emulation’ mode. MBRWizard 3.0.73: Directly update and modify the Master Boot Record. MbrFix 1.3: to backup, restore, fix the boot code in the MBR. MBR Utility 1.05: to manipulate a drive’s master boot record (MBR) via the command line. MBRWork 1.08: a utility to perform some common and uncommon MBR functions. MBRTool 2.3.200: backup, verify, restore, edit, refresh, remove, display, re-write and more. MemDisk 4.04: to allow booting legacy operating systems, floppy images, hard disk images and some ISO images. PLoP Boot Manager 5.0.13: a small program to boot different operating systems harddisk, floppy, CD/DVD or from USB, it can boot from an USB/CD/DVD even without BIOS support. RMPrepUSB 2.1.620: Partition and format your USB drive and make it bootable. XOSL 1.1.5: A graphical boot manager that supports multi-booting of various operating systems. Dos tools: Collection of dos utilities 7zdec.exe extract.exe pkzip.exe pkunzip.exe lha.exe gzip.exe uharcd.exe imgExtrc.exe xcopy.exe diskcopy.com mouse.com undelete.com edit.com fdisk.exe fdisk2.exe fdisk3.exe lf.exe delpart.exe wipe.com zap.com format.com deltree.exe more.com find.exe hex.exe debug.exe split.exe mem.exe attrib.com sys.com smartdrv.exe xmsdsk.exe killer.exe share.exe scandisk.exe guest.exe doskey.exe duse.exe move.exe setver.exe intersvr.exe interlnk.exe loadlin.exe lfndos.exe doslfn.com and more. Interlnk support at COM1/LPT1: to access another computer from COM/LPT port. Complete Internet Repair 1.2.8.1283: All in one tool to repair common internet connection issues, it attempts to repair everything internet related on a Windows system. CurrPorts 1.96: displays the list of all currently opened TCP and UDP ports on your computer. Network Password Recovery 1.32: Recover Windows XP/Vista network passwords / Credentials file. PuTTY 0.60 r3: PuTTY Tray is a free and open source terminal emulator application which can act as a client for the SSH and Telnet. SoftPerfect Network Scanner 5.2.3: Multi-threaded IP, NetBIOS and SNMP scanner with a modern interface and many advanced features. SmartSniff 1.85: Network monitoring utility that allows you to capture TCP/IP packets that pass through your network adapter. TCPView 3.05: Lists TCP and UDP endpoints, including the Local/Remote addresses of TCP connections. TFtpd32 4.0: Tftpd32 is for Trivial File Transfer Protocol (TFTP) client, including DHCP, TFTP, SNTP and Syslog servers, can also be used for PXE boot. WinSCP 4.3.5: A free and open source SFTP/FTP client to secure file transfer between a local and a remote computer. WirelessNetView 1.38: Wireless Net View monitors the activity of wireless networks around you. Defraggler 2.07.346: to defrag your entire hard drive or individual files. MyDefrag 4.3.1: Free disk defragment and optimize utility (formerly JkDefrag) for Windows 2000/2003/XP/Vista/Windows 7. Calcute 11.5.27: A compact scientific tape calculator with many features. Don’t Sleep 2.42: Temporarily suspend power management and prevent system shutdown, Standby, Hibernate, Turn Off and Restart. Fix NTLDR is missing: Fix ‘NTLDR is missing, Press any key to restart’ for Windows Xp. 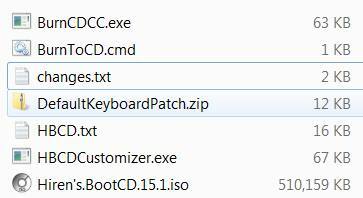 HBCD Customizer 3.0: HBCDCustomizer.exe is a GUI tool to create custom iso images of Hiren’s BootCD. 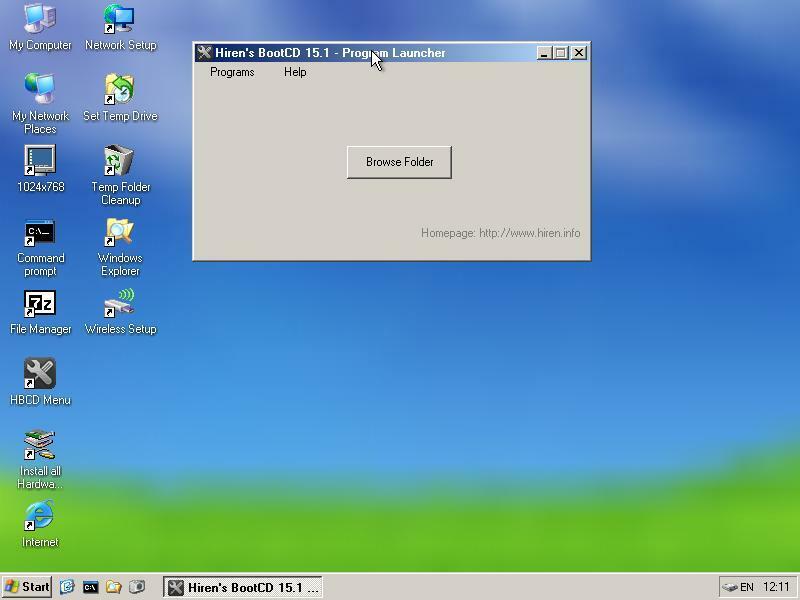 HBCD Program Launcher 3.2: Hiren’s BootCD Program launcher (HBCDMenu.exe and HBCDMenu.csv) can be used to launch all these programs from USB/CD. Mouse Emulator 2.2: You can use your keyboard numpad as a mouse, very useful if your mouse broken or if you are having USB driver problems. NT 6.x fast installer: Install Windows Vista/7 directly to hard drive/usb extenal drive. On-Screen Keyboard: A utility that displays a virtual keyboard on the computer screen that allows people with mobility impairments to type data by using a pointing device or joystick. Parted Magic 6.7: Linux based rescue environment with lots of applications to manage partitions, backup and recovery such as GParted, Parted, Partition Image, TestDisk, Partimage, Truecrypt, Clonezilla, G4L, Firefox, ClamAV, GSmartControl, SimpleBurn, dd, ddrescue, with extensive collection of file system tools are also included, supports the following: btrfs, ext2, ext3, ext4, fat16, fat32, hfs, hfs+, jfs, linux-swap, ntfs, reiserfs, reiser4, and xfs. Universal TCP/IP Network 6.5: MSDOS Network Client to connect via TCP/IP to a Microsoft based network. The network can either be a peer-to-peer or a server based network, it contains 98 different network card drivers. 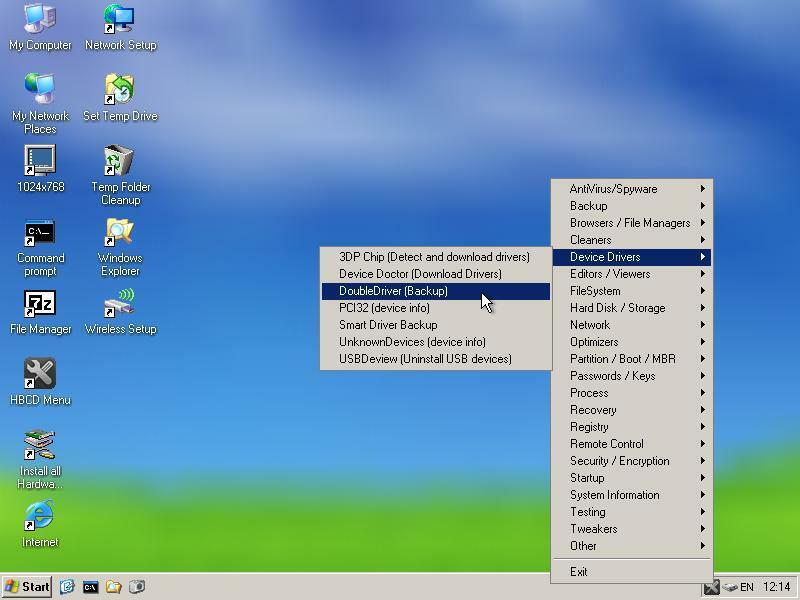 WinNTSetup 1.5.0.3: Install Windows 2k/XP/2003 x86/x64 from USB/CD under PE/LiveXp, allows you to apply tweaks and choose driveletter for the new Windows installation. Fat32 Formatter GUI 1.01: Windows XP cannot format a volume bigger than 32GB with FAT32. GParted Partition Editor 0.9.1: to create, copy, paste, delete, hide, resize or move partitions without losing data, a good freeware alternative to Partition Magic. Mount Drives 1.1: Auto Mount Drives can be used to mount unmounted/hidden drives. Partition Wizard Home Edition 7.0: Free Partition Magic Alternative, Partition Resize/Move/Copy/Create/Delete/Format/Convert, Explore, etc. SPecial Fdisk 2000.03v: SPFDISK is a partition tool. The Partition Resizer 1.3.4: move and resize your partitions in one step. USB Format Tool: Format/make bootable any USB flash drive to FAT, FAT32, or NTFS partition. Volume Serial Number Changer 1.2: Allow you to change the drive’s serial number on FAT, FAT32 and NTFS file systems. Autologon 3.01: Enables you to easily configure Windows’ built-in autologon mechanism, so you don’t have to wait on the login screen. BIOS Master Password Generator: Collection of password generator tools to reset BIOS Power on Password / Administrator password on Acer, Compaq, Dell, Fujitsu Siemens, Hewlett Packard, Phoenix, Samsung and other generic brand Laptops. BulletsPassView 1.10: Reveal the passwords stored behind the bullet (asterisk) characters in Windows / IE (Updated Asterisk Logger). Dialupass 3.16: Find and extract Username, Password, and Domain of DialUp/RAS/VPN networking in Windows. Kon-Boot 1.0: to bypass Login Password of Windows (32bit, any password) and Linux login as kon-usr. LicenseCrawler 1.6.0.182: find the license keys and serial numbers of your programs. Mail PassView 1.77: Recovers mail passwords of Outlook Express, MS Outlook, IncrediMail, Eudora, etc. MessenPass 1.42: A password recovery tool that reveals the passwords of several instant messangers. NTPWEdit 0.3: Password editor for Windows NT based systems to change or remove passwords for local system accounts. Offline NT Password Changer 2011-05-11: utility to reset/unlock windows NT/2000/XP/Vista/7 administrator/user password. Password Renew 1.1: Utility to set/reset windows NT/2000/XP/Vista/7 (32bit only) passwords. ProduKey 1.53: Recovers lost the product key of your Windows/Office. PST (Outlook) Password Recovery 1.16: PstPassword is a small utility that recovers lost password of Outlook .PST (Personal Folders) file. Router IP/Passwords: The complete list of Default Router Passwords and Default Router IP Addresses, can be useful if you have misplaced the manual or lost your router password. SniffPass 1.12: A password monitoring tool that listens to your network, capture the passwords that pass through your network adapter, it works on POP3, IMAP4, SMTP, FTP, and HTTP protocols and recovers lost Web/FTP/Email passwords. WebBrowserPassView 1.15: Allows you to view the user names and passwords stored by Mozilla Firefox, Opera, Safari, Google Chrome and Internet explorer Web browsers. WirelessKeyView 1.36: Recovers all wireless network keys (WEP/WPA) stored in your computer by WZC Wireless Zero Configuration. Dependency Walker 2.2: Checks for missing/invalid DLL/modules/functions for any exe/dll/ocx/sys. OpenedFilesView 1.52: View opened/locked files in your system, sharing violation issues. Process Explorer 15.05: Shows you information about which handles and DLLs processes have opened or loaded. Process Monitor 2.96: to monitor real-time file system, Registry and process/thread activity, This tool replaces Filemon and Regmon. ProcessActivityView 1.11: Detailed process access information read/write/opened files etc. RKill (07-12-2011): RKill just kills malware processes, imports a Registry file that removes incorrect file associations and fixes policies that stop us from using certain tools. RunAsDate 1.10: allows you to run a program in the date and time that you specify. Unlocker 1.9.1: This tool can delete file/folder when you get this message – Cannot delete file: Access is denied, The file is in use by another program etc. DataRescue DD 1.0: DrDD is a disk imager intended for data recovery and backup of partially corrupted storage devices, the main advantages are Range Selection and Copy Backward Direction. DiskDigger 0.8.3.176: Undelete and recover lost photos, videos, music, documents and other formats from your hard drive, memory cards and USB flash drives. DiskGenius 3.2: Restore deleted partition, Rebuild MBR, Rebuild partition table, Recover files, Restore formatted partition, Backup files by partition, Disk clone, Backup partition table, Create/Delete/Format Partitions etc. IsoBuster 2.8.5: CD/DVD/Blu-ray and Disk Image File data recovery tool that can read and extract files, tracks and sessions from CD-i, VCD, SVCD, CD-ROM, CD-ROM XA, DVD, DVCD BD and HD DVD and other media as well as a wide variety of disk image formats, it also has retry-mechanisms for damaged CD/DVD. Partition Find and Mount 2.31: Partition Find and Mount software is designed to find lost or deleted partitions. PartitionRecovery 1.0: A freeware tool to recover accidentally deleted partitions. PhotoRec 6.13b: Tool to Recover File and pictures from Dos/Windows/Linux. Recuva 1.41.537: Restore deleted files from Hard Drive, Digital Camera Memory Card, usb mp3 player etc. ShadowExplorer 0.8: Shadow Explorer allows you to browse the shadow copies created by the Windows Volume Shadow Copy Service and retrieve older versions from files you accidentally deleted or altered. Smart Partition Recovery 3.3: Find Lost NTFS partitions and restore them back. SoftPerfect File Recovery 1.2: to restore accidentally deleted files from hard drive, USB flash drives, CF and SD memory cards. TestDisk 6.13b: Tool to check and undelete partition from Dos/Windows/Linux. TrID File Identifier 2.10: Alternative of UnChk and FileChk to recover filetype from the file content. Unstoppable Copier 5.2: Allows you to copy files from disks with problems such as bad sectors, scratches or that just give errors when reading data. ERUNT 1.1j: The Emergency Recovery Utility NT Registry Backup and Restore for Windows NT/2000/2003/XP. 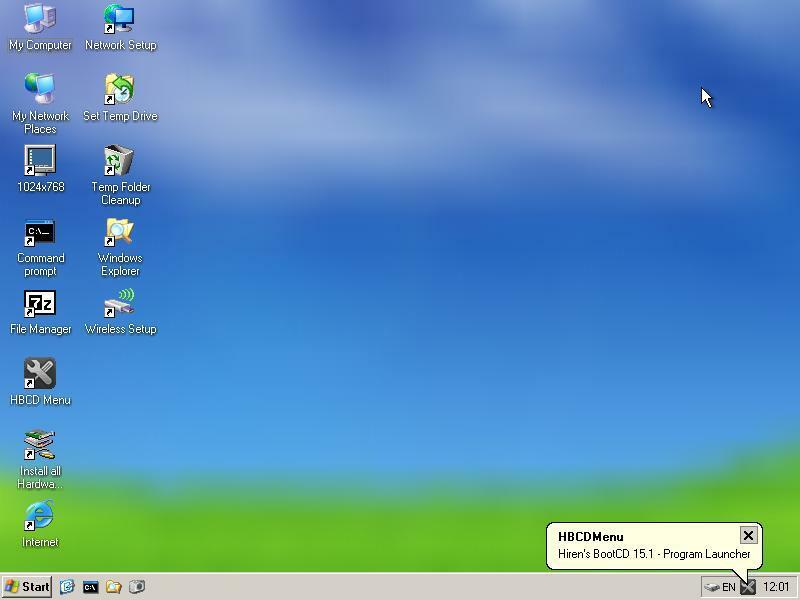 Fix HDC: Fix the Hard Drive Controller when replacing your motherboard on an XP system. Glary Registry Repair 3.3.0.852: an advanced registry cleaner that allows you to safely scan, clean, and repair registry problems. RegFromApp 1.22: Monitors/exports the Registry changes made by the selected application. Regmon 7.04: A monitoring utility that will show you which applications are accessing your Registry. RegScanner 1.85: Tool to find/search in the Registry of Windows. RegShot 1.8.2: a registry compare utility that allows you to quickly take a snapshot of your registry and then compare it with a second one – done after doing system changes or installing a new software product. TeamViewer 6.0.10462: Access any remote computer via Internet just like sitting in front of it, even through firewalls. TightVNC 2.0.4: Cross-platform Remote Desktop Software to view/control remote pc with mouse and keyboard. DiskCryptor 0.9: High speed disk encryption tool to encrypt all disk/partitions, including the system partition encryption support. FreeOTFE 5.21: Free, open source, on-the-fly transparent disk encryption program. TrueCrypt 7.1: On-the-fly Linux/Windows disk encryption tool, can create a virtual encrypted disk within a file and mount it as a real disk, can also encrypt an entire HDD/Partition/USB Drive. Autoruns 11.0: Displays All the entries from startup folder, Run, RunOnce, and other Registry keys, Explorer shell extensions,toolbars, browser helper objects, Winlogon notifications, auto-start services, Scheduled Tasks, Winsock, LSA Providers, Remove Drivers and much more which helps to remove nasty spyware/adware and viruses. HijackThis 2.0.5b: a general homepage hijackers detector and remover and more. ServiWin 1.48: Alternative Windows Services/Drivers Tool. Silent Runners Revision 63: A free script that helps detect spyware, malware and adware in the startup process. Astra 5.50: Advanced System info Tool and Reporting Assistant. BlueScreenView 1.40: Scans minidump files for BSOD (blue screen of death) crash information. CPU Identification utility 1.20: CHKCPU.EXE Detailed information on CPU. CPU-Z 1.58: It gathers information on some of the main devices of your system. GPU-Z 0.5.5: A lightweight utility designed to give you all information about your video card and GPU. HWiNFO 5.5.2: a powerful system information utility. Navratil Software System Information 0.60.45: High-end professional system information tool. PCI and AGP info Tool (12-09-2011): The PCI System information and Exploration tool. PC Wizard 2010.1.961: PCWizard is a powerful system information/benchmark utility designed especially for detection of hardware. SIW 2011.09.16: Gathers detailed information about your system properties and settings. Speccy 1.13.276: an advanced System Information tool for your PC. System Explorer 3.0.6: Shows detailed system information about processes, startups, IE addons, drivers, explorer, etc. Update Checker 1.038: scans your computer for installed software and checks for newer releases on FileHippo. Bart’s Stuff Test 5.1.4: Long term heavy stress testing storage devices. GoldMemory 5.07: Memory Diagnostic Tests. H2testw 1.4: Check your USB Flash memory cards, internal/external hard drives and network drives for errors with this tool. HDD Scan 2.8: HDDScan is a Low-level HDD diagnostic tool, it scans surface find bad sectors etc. Memtest86+ 4.20: PC Memory Test. Prime95 25.11: This will detect for errors in CPU or RAM within a matter of minutes if an overclock is not stable, you can run Torture Test (burn-in) overnight to ensure long-term stability of the hardware. System Speed Test 4.78: it tests CPU, harddrive, ect. Video Memory Stress Test CE 1.21: Tests all video RAM accessible by 32-bit CPU address space from a clean environment. Windows Memory Diagnostic: a RAM Test tool. Disable Autorun: A small tweak which disables processing of autorun.inf to protect your PC from usb autorun viruses. Disable Compress Old Files: This registry tweak is useful when Disk Cleanup Tool Stops Responding While Compressing Old Files. FileTypesMan 1.61: File Types Manager for Windows to add, edit, and remove actions in the properties and flags of each file type. InstalledCodec 1.25: Disable/Enable Installed Codec drivers and DirectShow filters. KeyTweak 2.3.0: a program to Remap Keyboard Layout, you can even customize a broken key to an unused key. Protect a Drive from Autorun Virus: Protect your pen drive from being infected when you plug it in an infected PC. Shell Extensions Manager (ShellExView) 1.66: An excellent tool to View and Manage all installed Context-menu/Shell extensions. ShellMenuNew 1.01: View/Change the list of all menu items in the ‘New’ submenu of Windows Explorer. Show Hidden Devices: Device Manager hides nonpresent devices that are not physically present in the system, but still have configuration information in the Registry. TweakUI 2.10: This PowerToy gives you access to system settings that are not exposed in Windows Xp. Ultimate Windows Tweaker 2.2: A TweakUI Utility for tweaking and optimizing Windows Vista. Write Protect USB Devices: Tweak your PC to make USB Pen Drive, Memory Card or Thumb Drive as Read Only. 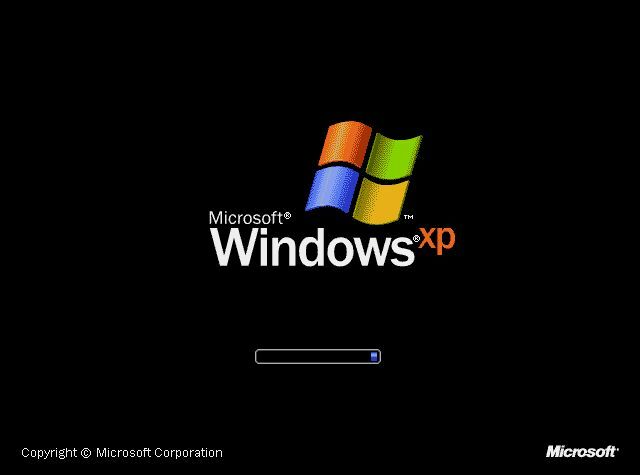 Xp-AntiSpy 3.97.11: it tweaks some Windows XP functions, and disables some unneeded Windows services quickly.